Aachen, July 2017 – The Institute of Plastics Processing (IKV) in Industry and the Skilled Crafts at RWTH Aachen University now has a new measuring device for the development of heating strategies for continuous vulcanisation. At a recent ceremony, Jens Möckel, Managing Director of Gerlach Maschinenbau GmbH in Nettetal, Germany, presented the new machine – a HeatStraD, Heating Strategy Developer – to IKV's extrusion pilot plant. The new vulcanisation unit was previously developed in a two-year joint ZIM project between Gerlach and IKV, and has now been made available to IKV as a prototype. With the new HeatStraD, IKV is able for the first time to heat simultaneously or sequentially rubber profiles by means of hot air, infrared radiation and microwave, and to measure the heating pattern of the profiles in cross section. These measurements make it possible, for different materials, to identify an optimum combination of the various forms of energy transmission with which profiles can be homogeneously heated. Furthermore, the two project partners can evaluate, by measuring the power input of the plant, the energy efficiency of the vulcanisation and heating strategy they have developed. The machine has a gas burner, with which the process air is heated, as well as radially arranged infrared lamps and a magnetron with an output of 3 kW. In addition, the comprehensive measuring technology allows an evaluation of air flow velocities and air temperatures in the working shaft as well as various plant and profile temperatures. This means that IKV can, for the first time, evaluate the entire heating process during continuous vulcanisation. 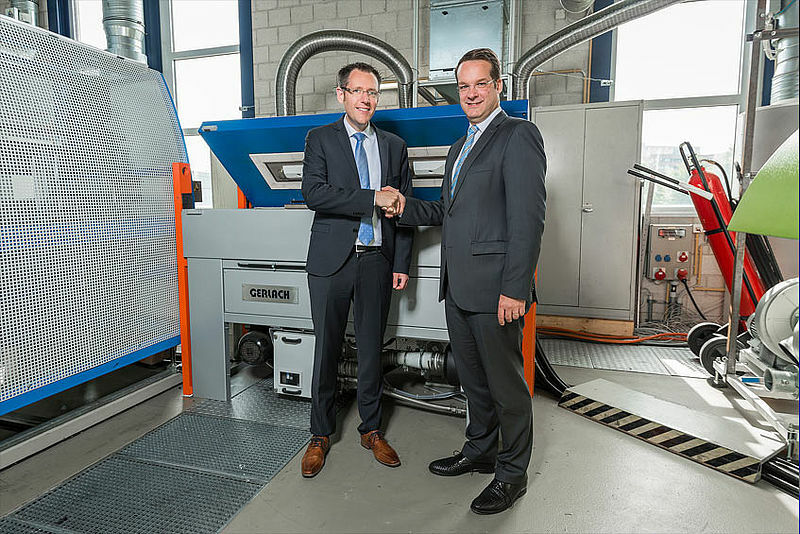 The head of the Institute, Professor Christian Hopmann, thanked Gerlach Maschinenbau for providing the innovative machine: "Continuous vulcanisation is an exciting area of research for us. In the course of the increasing digitisation of production, continuous vulcanisation has until now been a major obstacle due to a lack of measuring possibilities and process models. Thanks to the new HeatStraD, we will in future be able to draw up new process models and also validate them. This means that we can improve the production of rubber profiles as a whole." For Jens Möckel, the machine also represents an important step forwards in the further development of continuous vulcanisation units: "Through the specific study of different heating technologies and the knowledge we have gained with the new HeatStraD, we can gain a deeper understanding of continuous vulcanisation and, as a result, offer our customers optimised, more efficient machine concepts together with unique services in process design." In the long term, IKV is planning to compare, with the help of the new measuring device, various heating mechanisms in continuous vulcanisation. The Institute is also aiming to describe the principles of microwave heating and thus replace the existing "black box" of continuous vulcanisation by drawing up and validating process models.